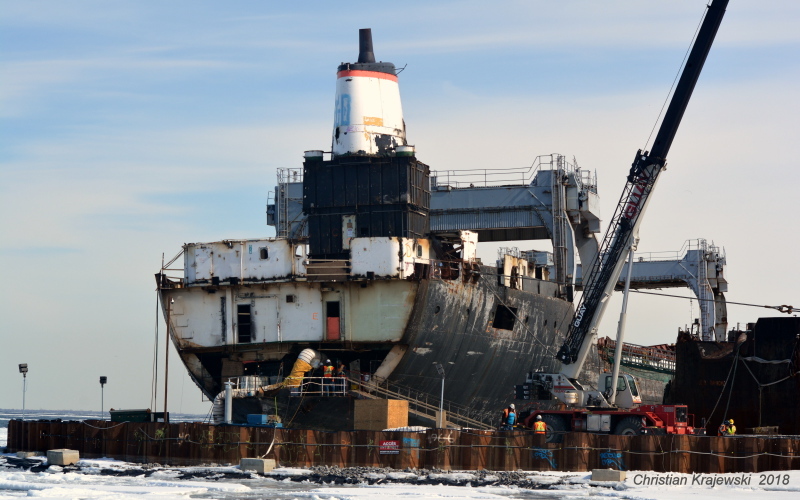 The KATHRYN SPIRIT being dismantle on the St.Lawrence River, near Beauharnois, located upstream from Montréal city, on March 22, 2018. As I understand from the newspaper, the fire started in the engine room, and presumably (according to the local Fire chief) in oil soaked insulation. Such a situation could have (and does) happen on ships still in service, both old and new. I have entered many purifier / fuel oil pump room's and noted a "fresh paint smell" from insulation around fuel pipes, and when squeezing gently on the insulation, oil is seeping thru, effectively making the insulation a fuse just missing a heat source to set it on fire. In this case, at a scrap (recycling) yard, I guess the "old lady" decided to expell some fumes for the very last time, and it looks like no one got injured. Similar fires has started on many ships while still in service, with more dramatic outcome. So they built a coffer dam around her !!! Wouldn't mind seeing it from the air. Can't you hire Tomas or one of the other Shipspotters who own a drone, Christian ? This photo has been shown 2,668 times since it was added to the site.